Wordsworth lost it when he saw fields of daffodils. I wonder what he thought of bluebells. It’s been a busy 2 weeks—a long-awaited holiday from work, with my birthday in the middle. Staycations around here always end up with a list of things I haven’t done, often seemingly longer than the to-do created at the beginning. Back to work tomorrow, and it’s tempting to slip into a maudlin haze of regret and self-flagellation. 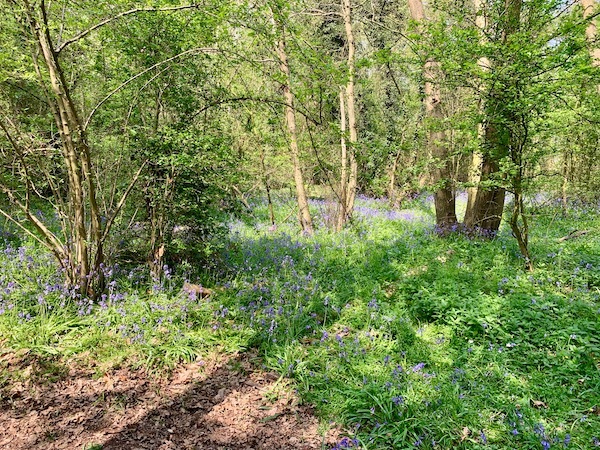 But this afternoon we took a trip out to some nearby woods with their eye-aching green and blue carpets, and the memory of what brought me back to these shores 10 years ago. I fell a bit behind with the shopping lists, which is a shame because I really wanted to show you this one before Christmas. It’s a full-blown pre-Christmas shop. Right at the top we’ve got mistletoe and greenery—both queried though: maybe she (definitely a ‘she’) wasn’t sure if Waitrose would have them, or maybe there was already another trip planned. There’s an interesting mix of precision here: carrots, leeks, clementines … but four bananas, two each of limes and lemons; haddock … but a general ‘dinner. Two crème fraiche (again; with diacritics), but a small cream. How many baguettes? A misfiled pastry (together with the foil this makes me think she shops by aisle, although I happen to know that the cream is not near the bread, so not entirely sure what’s going on there. Perhaps it’s by recipe rather than aisle?). Questions remain. What sort of wine? Why is panko underlined? Did she decide on tonic, or soda? Which paper? I feel there’s a metaphor in here, somewhere. So that was Christmas. And what I did was a little project that you might have missed: a photo for every day of Christmas, from the first to the twelfth. No commentary or explanation, just the photo, and the day as a title. Each photograph had something to do with our family Christmas, and hopefully will remind us of some of the fun things we got up to. While each photograph might not have been from the actual day it was posted, it was taken within a few days. They’re all on Instagram, no tags or anything (so really difficult to find or link together, not entirely by lack of design), but they are our first 12 pictures on the account. Hastily snapped this, as we went into the shop. But to be clear, the mystery shopper wanted the same number of fillets as en croute. Perhaps they were having coeliacs around? An engineer’s or a computer programmer’s brain behind this list, I fancy. Or perhaps ex-military. Eggs, large*. Vanish, small. Tea, milk two sugars. I’m assuming the tin (large; cut) is bread. Purée, accent (approval). I’m hesitant to forgive the ‘water’ though. Come on. This is England, and plastic is overrated. Won’t somebody please think of the oceans. *But a strange inconsistency—I would have expected ‘Eggs, large, 6’. 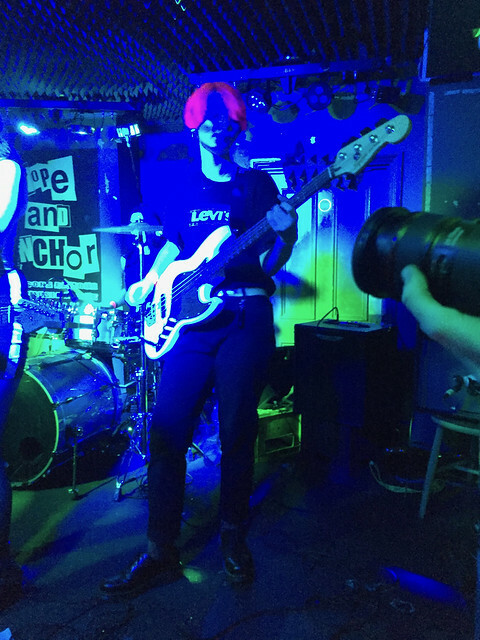 I went to a gig on Friday night. 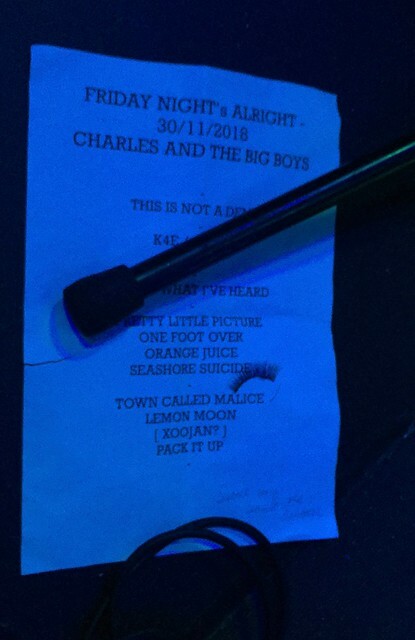 That in itself is probably worth a blog post, but this gig was a bit special because the Younger Pawn was playing bass in a band called Charles and the Big Boys, and they were supporting an apparently well-known act playing in Islington. I’d managed to keep the date free from work trip commitments and childcare duties (which again is a post on its own), and with an eye on the fast trains to Gravesend, went along. The elder pawn was visiting from Southampton, and both boyfriends were there, so it was a real family affair. YP was especially pleased, having been trying to get me to one of their gigs for a good time now. Given the ages of the C&tBB members—it actually Charles’ 19th birthday—I expected to be the oldest person in the room, but the crowd demographic was curious. It was mainly 50+ year-old men. There were a few women of similar age, a young cove in a parka … my kids, and the Big Boys. The reason for this became apparent when the first act took the stage. Some middle-aged bloke in a trilby, backed by (presumably) his wife, two guitarists and a drummer (who, surprisingly, seemed to be about 15). The music was kind of mod/ska revival; decent enough tunes that you could jiggle along to, although the exhortation to skank did seem a little out of place. Obviously the crowd were their mates. The second act I really enjoyed. Rock/punk: the lead singer (again, in his 40s) belted them out with passion and energy, and the lead guitarist (who remained from the first act) got a chance to shine with some screaming solos. And a harmonica. Now, this was when C&tBB were supposed to be on, and then I could have made my exit, avoided the carnage of the last fast train of a Friday night. But sadly, the keyboard player had had a death in the family, and the headline act was a man down. So they shorted their set list, and played what they could. 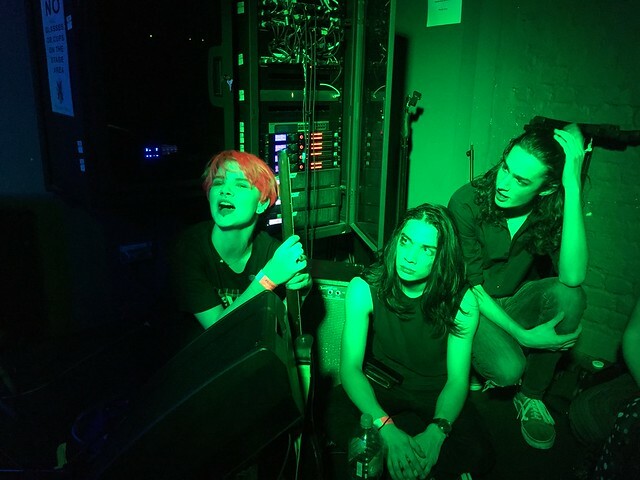 As a support act. And this was the band that all these middle-aged men (and their wives) had come along to see. Even allowing for the lack of a keyboard, it was pretty staid, to be honest. Although these guys have been featured on national radio, even the crowd-pleaser at the end (with its call and response) felt flat. Less mod, more MOR. They went on a bit, and by this time I was getting seriously worried about that last train. But finally, C&tBB came on, and we lost most of the middle-aged blokes in the crowd. It’s a small venue, and it did leave the back of the room feeling a bit empty. But I hope that those who did stick around appreciated it, for this was worth waiting for: young, energetic, passionate and original. I certainly did, and was buzzing as I hugged YP and headed for the last train to Kent. 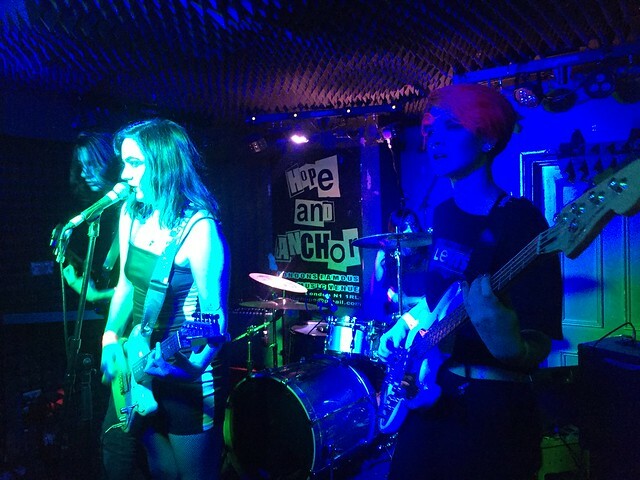 And that, boys and girls, is how my daughter’s band headlined the Hope and Anchor. This list is written on a crumpled Post-It note. I like it. Crisp, business-like, no nonsense. Actually scrunched up to be discarded when it had served its purpose. A parent, with young children. Tuna. Fine. Rock salt—not the sea flakes of someone who is really into cooking, but commendable. Busy parent probably has no time for salting her chicken the night before. Baking powder. Bicarb and eggs. I see a cake in her children’s future. Shapes… what kind of shapes? Family shorthand—fine. No particular order, this; probably written down as the thoughts occurred, or as she surveyed her organized if slightly untidy kitchen (this is not a judgement: kitchens are always untidy if there are children in the house. Unless you’re some kind of psychopath). Washing up liquid—any old brand will do, I guess. Suckies—those delicious yogurty things that it is actually against the law to eat if you’re over the age of about 7. Sesame chicken… mmm, I’m liking this. Mayo, sure. Chicken again—wait, what’s this? A filing breakdown? Or maybe they do really like chicken. Bananas, blue milk (of course—children again) and croissants for Sunday morning breakfast. Perhaps with home-made jam? We know she bakes, so perhaps. Antibac wipes. Children, sure; fastidious, definitely—even if this list weren’t a dead giveaway. Fabric softener, and then, way out on the right-hand side, almost less than an afterthought, ‘unstoppables‘. I had to look these up. Not just children, but possibly very small, somewhat pungent children as well. Whoever you are, I hope they enjoyed the sesame chicken. 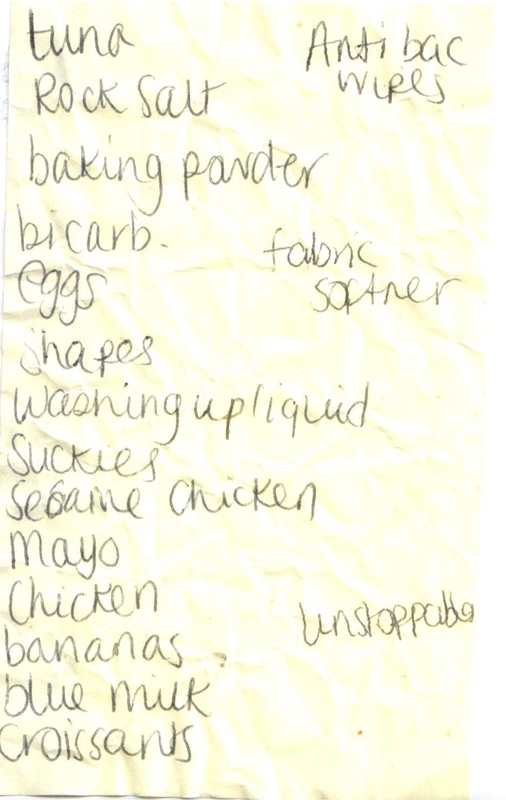 A year or more ago we were doing our weekly shop, and I found a shopping list in the trolley. 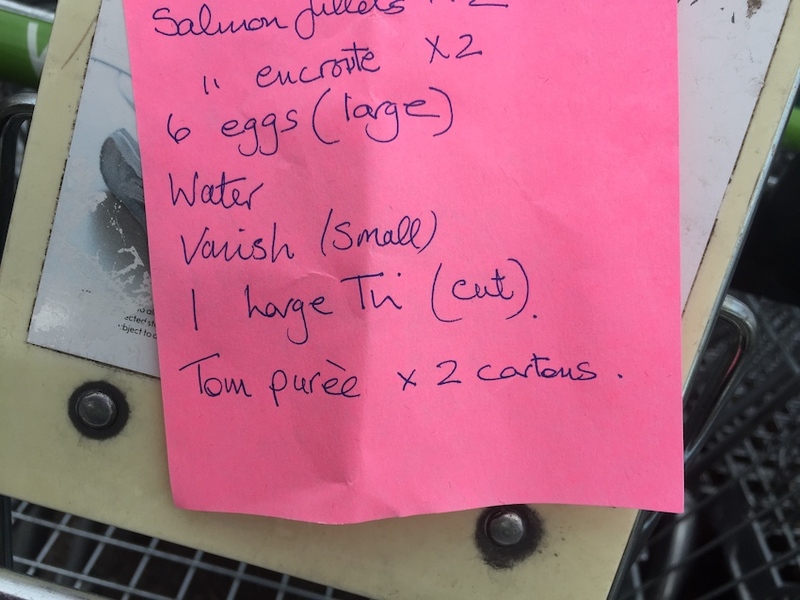 Not ours—evidently somebody had been to the shop, got their stuff, and left their list behind (by design or accident is not recorded). It’s written on the back of a carefully cut ‘Visit Canterbury’ postcard; the fragment I have has ‘Royal Museum and Free Library (Founded 1858)’ on the picture side. The edge is 4″, so if this is a 4″x6″ postcard we could hypothesize the shopper managed to get three shopping lists from this one card. I admire the thrift, and wonder where the other two are. The list itself isn’t remarkable—cereal, coffee, peas (fresh or frozen though? ), beans and fruit… ah! She (I think it’s a she, from the writing) wrote ‘peas’ twice and then scrubbed one out. If we were to categorize our shopping we might put peas with runner beans, although it’s that one that’s redacted. Some, if I may be so bold, distinctly middle class fruit. A specific number of lemons. Four lamb chops… shopping for dinner with friends? A family of four Sunday lunch? Sourdough bread… just one, mind. Unit unspecified. White wine, and red wine—1 bottle. How much white wine then? Multiple units? Is the ‘1 bottle’ an exhortation not to get carried away? What is it about the 1 bottle of red wine, an elegant sufficiency? And is our mystery shopper going to open it when they serve the lamb chops with peas and beans? I do hope so, but I guess we’ll never know. I often, if not always, take my laptop with me on holiday. Ostensibly it’s to write (for pleasure, definitely not work), but always—but always—that never ends up happening and we just use it for looking at all the photos we’ve taken. This time, on a hill in Tuscany, it’s been different. I’ve managed, over the last two or three nights, to finally finish a project that has been about 11 years in the making. 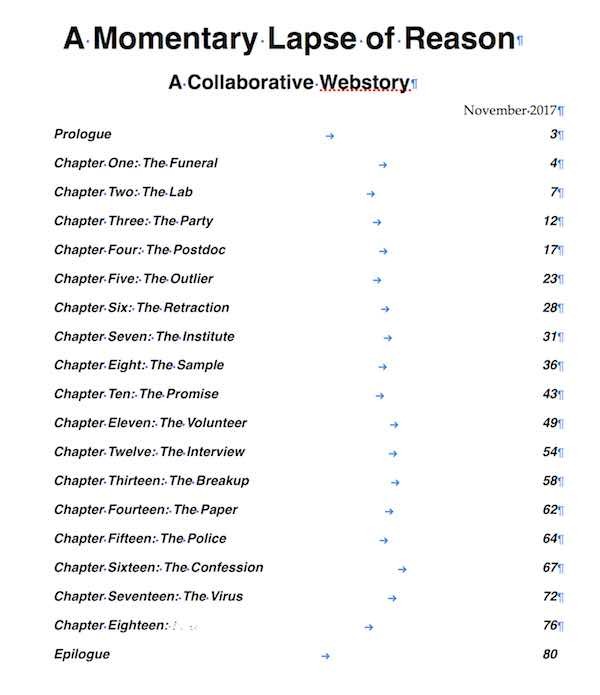 Coming to a Lablit.com near you soon. A little while ago I managed not only to photograph the Google StreetView car somewhere in Fitzrovia, but also to capture the picture it took of me doing it. Earlier today I was on my way to Halfords and find myself peering at a more advanced model, in reverse gear at a traffic light. It might be time to re-offer that drink to the first person to spot me tailing MK14 NWT. A long time ago, in a galaxy far, far away, there was a Webstory. And that Webstory grew and prospered, at least for a time. And the Curator of the Webstory strove to breathe live into it, but with one thing and another the interval between updates grew longer and longer, until it languished around Chapter Fourteen, and all had given up hope. For lo, there is but one chapter left to write, and it shall appear on LabLit, and there shall be great rejoicing.